The word “interesting” registered in my mind when I first saw the long palm staffs young children held in their hand on Palm Sunday here in Barcelona. 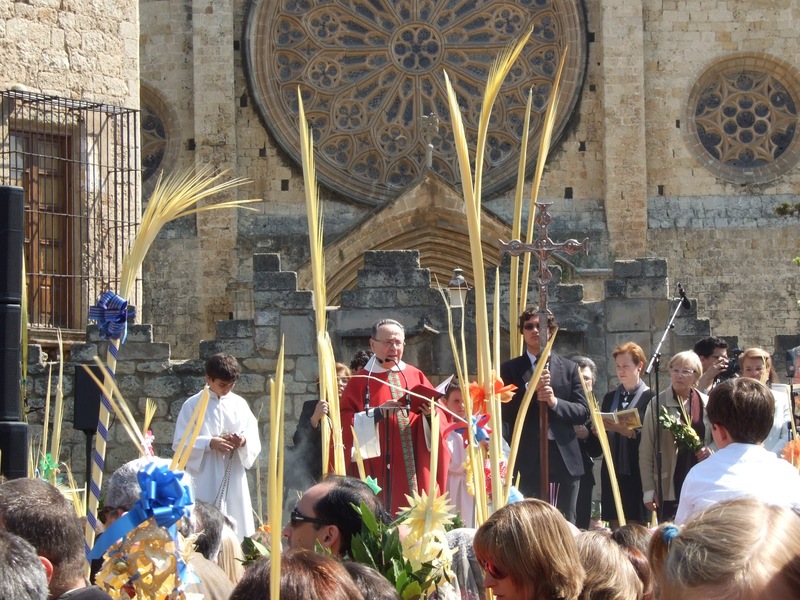 I admit that I was fascinated with the stark difference in celebration of Palm Sunday here in Spain with that of my experience of it in California. Growing up in a small unremarkable city, we made palm chains in catechism class at St. Benedict’s. We were given palm strands to weave into chains or fold to make a cross. 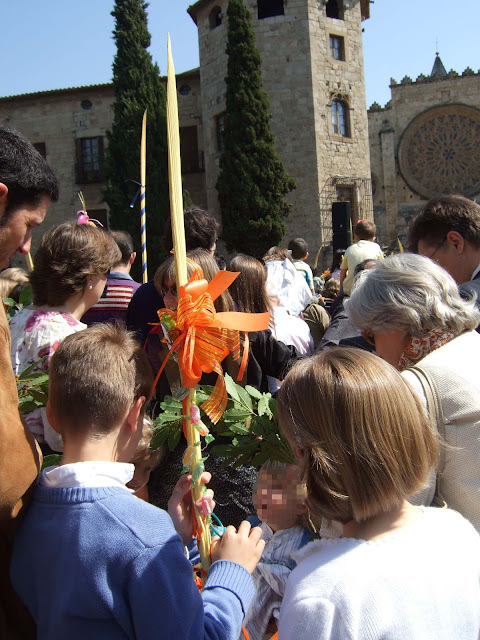 Meanwhile, adults attending service would receive palm strands outside church doors that were blessed afterward during mass by the priest waving his aspergillum. My family would come home with palm strands, and we apprentices of palm weaving at Sunday school, would bend the fronds with care and attention to duplicate the weaves learned in class to make braids. Those hand held works of apparent art made back home appear diminutive and dull compared to the palmón and palma that young catalan children hold in their puny hand on Palm Sunday. Not only are these palm creations twice the size of the little person holding it, but is decorated with ribbon and sugared goodies. It is quite the tradition for families to attend church and participate in a mass blessing of the palms outside the church by the priest waving his aspergillum as custom dictates. Some families may attend for religious purposes. 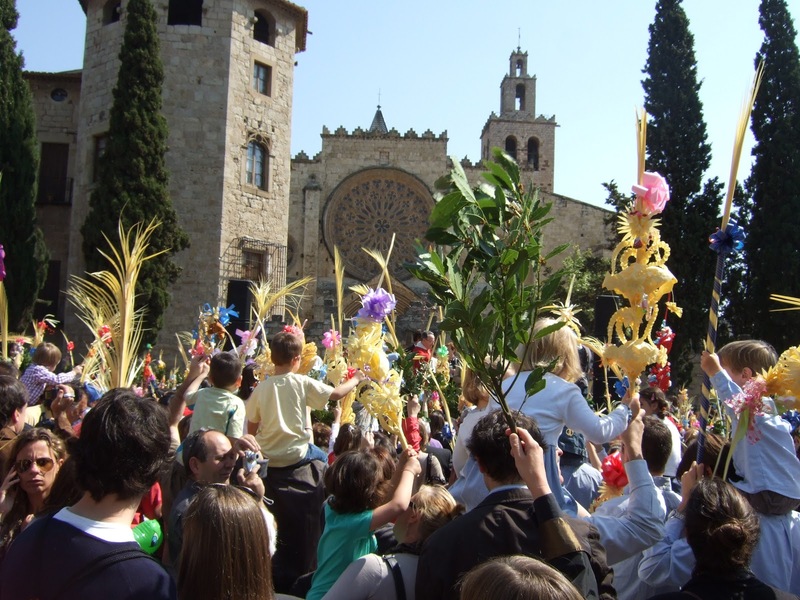 They attend mass to celebrate Jesus’ triumphant arrival in Jerusalem, who rode upon a donkey as crowds flung palm fronds and cloaks to the ground for him to tread on, an act reserved for people regarded in the highest honor. Other families are there in celebration as an outing for children to enjoy. 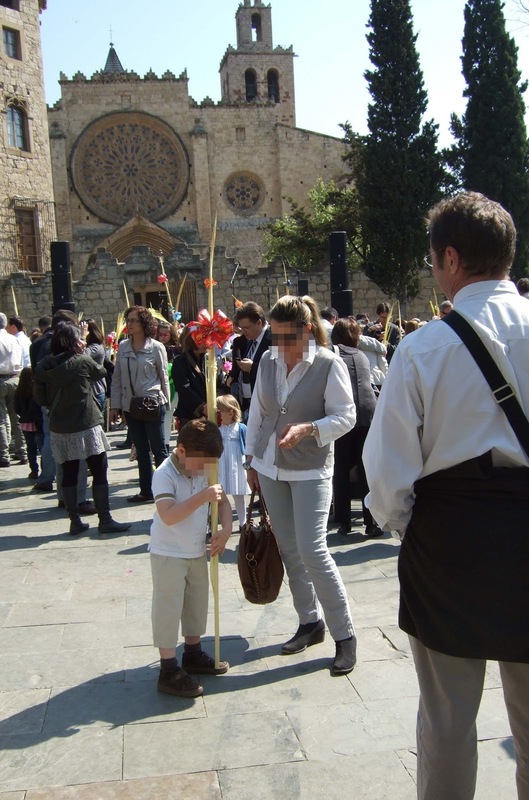 So I ask myself, who gives these palm staffs to children? The response to this inquiry is the child’s godmother. 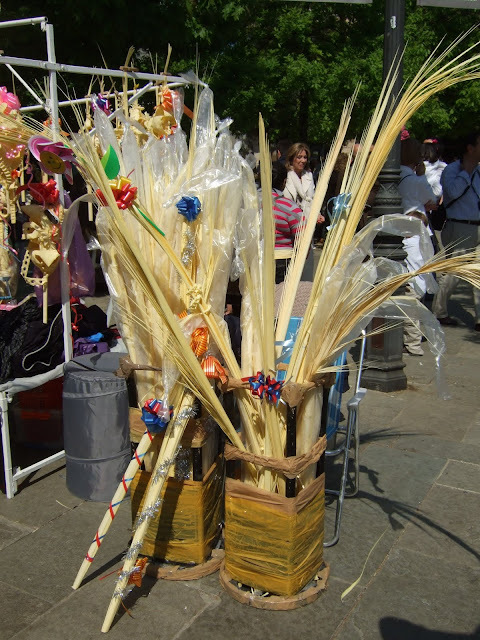 If you are asked to be godmother to someone’s child, it becomes your responsibility to gift your goddaughter/son with a palmón or palma. Boys get the long palm staff with a ribbon tied to the top part and girls get a short hand held palma that is intricately woven in plaits to create different latern style forms with hearts and crosses. Some may have more than one tier of braided or curled palm fronds. When my mother-in-law was a child, caramel rosaries hung from the palmas. I instead saw popular candy; packs of kid craze rubber band bracelets and plastic whistles hanging from them. A different type of branch was on the scene, hand held branches of laurel leaves by women. After they are blessed, the leaves are dried and used in the kitchen for cooking. As for the palmones and palmas, they were once hung on the balconies until the following year. I assume nowadays they are thrown out when the novelty has worn out. Side note: I love this word, aspergillum. I am fascinated by this hand held object dunked into the aspersorium, so that the little sponge inside it becomes soaked with holy water. Sant Cugat Monestary--My intention was to drive into Barcelona and witness Palm Sunday at the Cathedral, but lower back pain kept in my town. Secondly, I forgot to recharge the battery to my camera. I only shot about 15 pictures before the camera died. 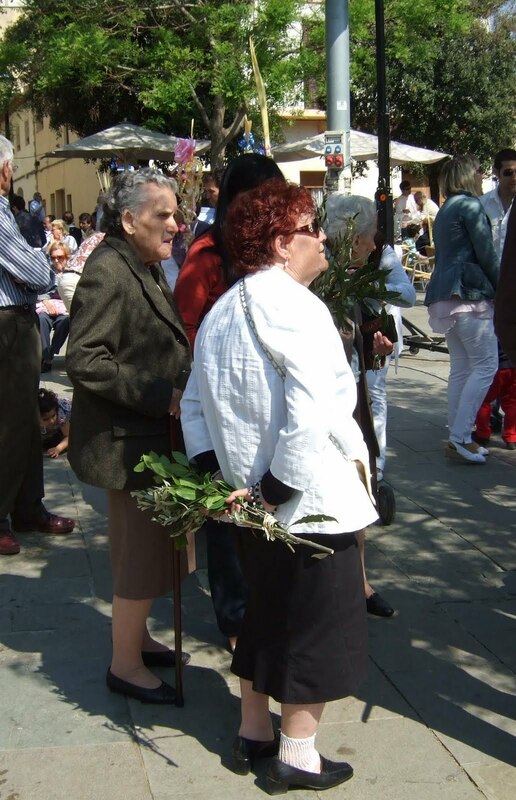 Elderly lady holding laurel branches. 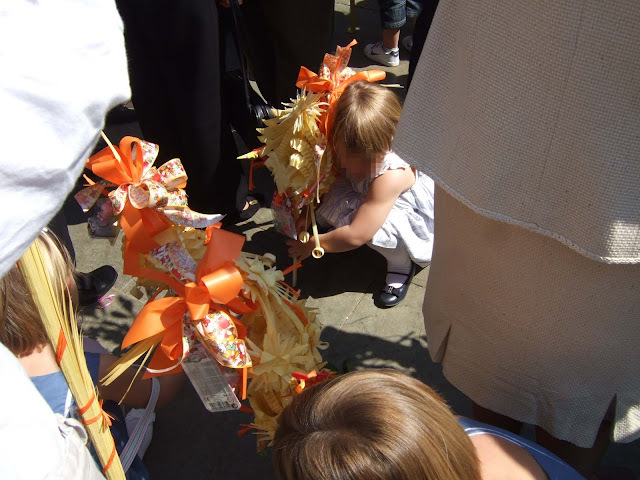 As the priest blesses the palms, children pound the ground with them. These little girls are hitting the floor with their palmas. Palma stand for those who have yet to purchase them for their godchildren. These palmones are not very embellished. Little girl fascinated by her brother's palmón. See the candy below the ribbon? "Domingo de Ramos, quien no estrena algo se le caen lás manos." 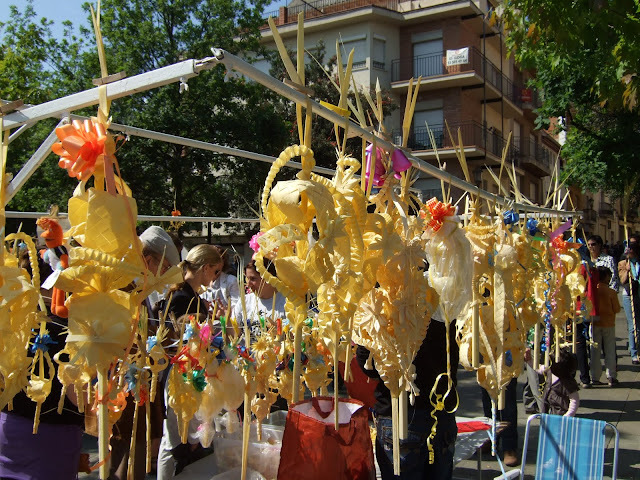 On Palm Sunday, those who do not wear something new will lose their hands. But I'm sure this little boy won't lose his hands even if he might not be sporting a new outfit. The swaying of palmones, palmas and laurel leaves as the priest waves the aspergillum at the crowd to sprinkle holy water . All church goers present were invited inside the church for the official mass, but David and I hopped back onto the moto to return home to give my back a rest. Fins després! Gràcies per compartir els teus pensaments! Welcome to my page! 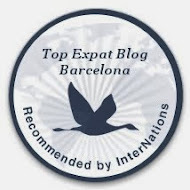 Read it, laugh, and learn something new about Barcelona. 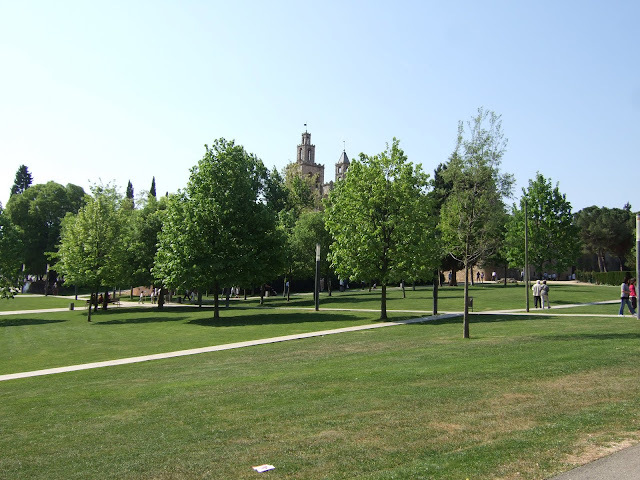 May it inspire you to visit one day. Adeu! © 2011-2015 Patty Sanchez. All rights reserved. Not for use as Public Domain. Thank you. . Simple theme. Powered by Blogger.